Married Geeks: Musical Chairs. Only Not Chairs, Animals. Musical Chairs. Only Not Chairs, Animals. Allow me to jump right in to a post and pretend it hasn't been a gajillion years since my last post. Pretty please? K, thanks. Remember Spikey Back Rockstar III? She was our red-eared slider turtle that lived with us for nearly 6 years. She grew so large, at one point we purchased a larger tank for her. And then she outgrew THAT tank. *sigh* This time she had the opportunity to go live on a farm. No really! OK, not so much a farm as a friend's house with a HUGE pond on the property. Our friend's daughter made her a welcome sign. Love! But it wouldn't be our house with a little bit lot of chaos. 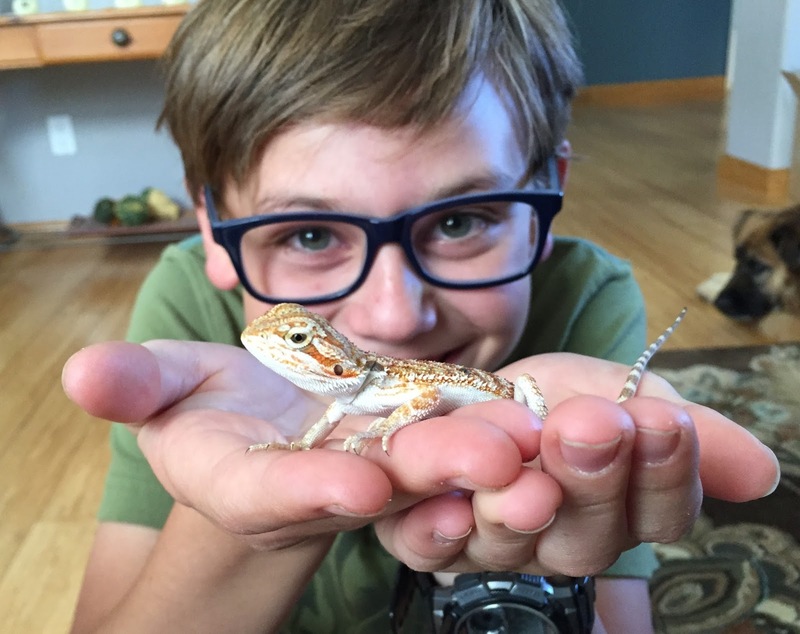 Prior to Spike's re-homing, we surprised the boy with a baby Bearded Dragon. Meet baby Echo. Not to be outdone, his sister had to have one and bought a Bearded Dragon with her own money. Meet M&M. We weren't worried about the kids having them. They had long proven their affection for creatures of the reptile persuasion. And behold! Everyone was happy. But not for long. Those little critters would cuddle and be so cute together. But then they grew up and became bitchy little teenagers. Echo started to dominate M&M. It turns out they are both boys. And yes, we checked their little lizard parts for proof. We've got mad skills over here, my friends. A geek and a handyman. Swoon! So happy with the way it turned out. And these awesome little creatures aren't trying to kill each other anymore. Bonus! However, the setup is trying to kill Greg. Less than 24 hours after the glorious completion, Greg was feeding Echo (top). 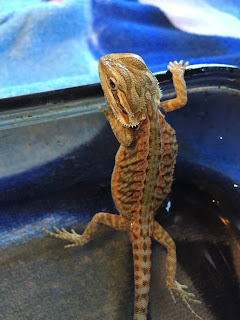 He leaned over to get some dubias to feed him, left the doors open, and when he stood up, the top of his head firmly met the open door, causing it to fall, creating a glistening sea of glass pieces on our floor. But not before hitting Greg's hand as he tried to catch it. Thankfully nothing but the door broke. Okay, and maybe a bit of his pride. Greg's head and hand are still in tact. We are currently waiting for a replacement door. Thankfully, we are a house with extras and still have yet ANOTHER tank for Echo to live in until it comes. Oh, did you see that I said we had dubias? 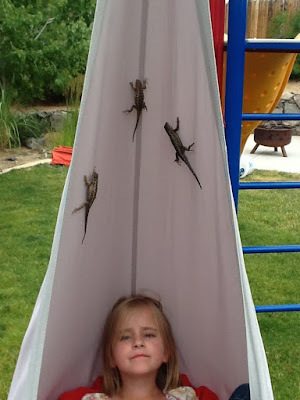 Not just dubias - a COLONY of them. Oh, yes, don't even get me started. It's cheaper and more economical to create a self-propagating colony of roaches to feed them than to run to Petsmart for crickets every couple of days. Want to hear about the one that got loose? I'll tell you, but you'll still come over to the house for a visit, right? My only regret is that I did not take a photo of the glass door aftermath. I think we should just be grateful your head and/or hand wasn't sliced wide open. Okay. now blog more. I'm hooked!!! LOL. Sorry bout the door and glad you were okay Greg.